In the mid 1980s, I was working in the Middle East and when it came to taking leave, we had 2 travel options. Head West for Europe or East for Asia. Whichever direction, the airline recommendations were always the same – try to fly on Singapore Airlines, Cathay Pacific or Malaysia Airlines. Why, because those airlines offered top quality service. Something the European carriers, with the exception perhaps of Swissair, were unwilling or unable to do. Emirates arrived in 1985, Oman and Qatar Air in 1993, Etihad in 2003. Prior to that, the only Gulf carriers were Saudi Airlines and Gulf Air. Thanks to their owner’s deep pockets, Emirates, Etihad and Qatar accelerated the establishment of their brands with massive investments in brand experiences. Since then, Singapore Airlines and Cathay Pacific have done their best to compete but Malaysia Airlines (MAB) was left far behind and today, is a mere shadow of the great brand it once was. To many, if it wasn’t for the Business and First class offerings, it’s essentially already a low cost carrier. Nevertheless, in its communications at least, Malaysia Airlines continues to give the outside world the impression it sees itself as a world-class carrier. These bold and practically impossible to live up to statements were supported by the usual professionally produced advertisements and videos shot in high definition with smiling cabin crew in brand new aircraft telling us about ‘Malaysian Hospitality’ and how it is a culture that ‘runs through the organization’. Now in some ways I think this is quite clever. Because if Malaysians are known for their warmth and generosity, then they only need to leverage on the natural capabilities of employees to deliver a potentially world class experience. But it also means that every crew on every flight, will have to be on top of their game non stop if they are to deliver a high level of service at every touch point, every time. And that delivery must meet the very diverse needs of very diverse passengers. And of course, the concept of ‘warmth and generosity’ may be difficult to deliver. Warmth yes, but generosity? What does that mean? Do you hug every passenger and give them a US$100 bill? Or do you upgrade everyone who asks? Don’t forget, the aim is to ‘represent Malaysian hospitality on behalf of the nation to all its guests and customers’. With such a promise, there can be no half measures. And of course you can be sure plenty of people will be waiting for the first fail. Is Malaysia Airlines delivering on the promises above? Despite the glossy high-end corporate videos, two videos have emerged recently to suggest it isn’t. 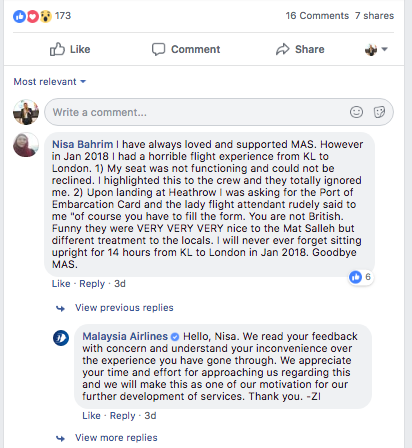 On their own, these videos could be dismissed as ‘one off’ rants by disgruntled customers but watched together and added to the explosion of negativity on the MAS Facebook page and a pattern seems to be emerging. This suggests to me that whatever training cabin crew are receiving is not linked to the big promise and whoever is responsible for measuring the effectiveness of that training, isn’t doing their job properly. Let’s take a look at the videos. The first one was uploaded to YouTube on November 20th 2018 by travel and aviation vlogger Josh Cahil who is based in Germany and has 23,000 followers on Instagram and close to 10,000 followers on Twitter. His YouTube video where he claimed he was bullied by “extremely unfriendly” MAS cabin crew on a flight from Kuala Lumpur to London has been viewed more than 280,000 times and generated more than 2,600 comments. International media in the UK and Australia picked up the story as well and in Malaysia it was covered by Says.com not to mention other news portals. The second video was circulated around Malaysia via Whatsapp towards the end of November 2018. This video was created by controversial travel hack, entrepreneur and author of “Don’t You Know Who I Think I Am? : Confessions of a First-Class A**hole” Justin Ross Lee. I have a suspicion this video was created some time ago because it features the Malaysia Airlines A380 and as far as I know, they aren’t using that aircraft on the London sector any more. But what both these videos do is show how Malaysia Airlines is unable to deliver on the bold promises it makes in its marketing. They also show the futility of spending large sums of money on big ideas and not linking that promise to the departments responsible for delivering on that promise when all it takes is one passenger to have a bad experience and share that experience across social media and the whole expensive, one size fits all campaign is ruined. This mass economy approach more suited to 1988 than to 2018 is built around the belief that with a large enough investment, an airline can make potential and existing passengers believe each bold statement it makes and that if it doesn’t deliver on that statement during their particular interaction with the brand, the passenger should just be grateful anyway. Following the Josh Cahil video, Malaysia Airlines initiated an investigation and according to Cahil, the group CEO sent him a template apology and offered him a refund, which he asked them to donate to a charity supported by them. The problem was that by this stage, the story was dominating social media conversations. Even corporate driven tactics on social media were being ambushed with negative comments. In fact the majority of MAB’s attempts to use social media in a positive way are being hijacked by negative comments. And when this happens, the firm doesn’t seem to grasp the link between what the commentators are saying online and what is happening offline. This is the dangerous spiral many brands are finding themselves on today. They don’t invest in the right training to deliver the experiences consumers demand offline. There are a variety of reasons for this and some of them sinister. Most common is that the scope of work for a campaign is created in isolation and by people who don’t understand the importance of delivering a ‘best in class’ customer experience. Which means that if the scope of work for the project is wrong, it is doomed to failure before it even starts. In despair or because they now have a channel in which to express their frustrations, consumers go online where they passionately vent those frustrations. And often they do it in the very space the company thinks it owns such as on a Facebook page, further diluting the ability of the brand to deliver on the brand promises made in the very expensive corporate driven messages it believes are defining its brand in the way it wants to be defined! And if that wasn’t bad enough, when passengers vent those frustrations online, the people tasked with representing the brand simply don’t have the skills or for that matter the responsibility to respond in a suitable manner. This exasperates the negativity around the brand, causing brand equity to plummet to such an extent that it can be almost impossible to escape the spiral into brand obscurity. Smart Brands understand the concept of the big idea belongs to the 1970s and much as the world has changed significantly since then, so should the way brands engage. 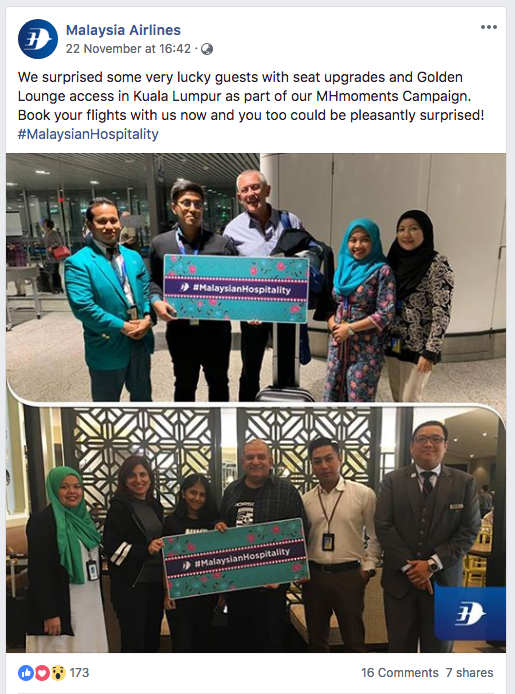 Malaysia Airlines must focus budgets not on telling people they deliver Malaysian Hospitality but on showing people they deliver Malaysian Hospitality. This requires a comprehensive overhaul of the marketing, advertising, customer relationship and social media strategies. Fusionbrand recommends this be carried out through a brand audit as soon as possible. Judging by these videos and the comments across Social Media, Malaysia Airlines see training as a box to be ticked. A review is required to identify if there is an understanding of what constitutes world class service. If the training providers have been hired for the wrong reasons and don’t have the skills to deliver the type of training required to compete with sector leaders, how can Malaysia Airlines cabin crew and for that matter ground crew, deliver a world class service? There’s no escaping social media but too many brands don’t give it suitable attention. Malaysia Airlines must start investing funds in social media instead of big idea promises it cannot keep. I don’t know what’s happening at MAB, but too many companies think social media is the perfect place for interns because they are young and have an Instagram account themselves. After all, what could be hard about posting on Facebook and Twitter, right? Wrong. Social Media is about many things. For brands, it’s about cultural, social and other nuances. Being responsible for a brand online is not something you do, it’s something you are. Malaysia Airlines needs to link what it says and does offline with what it says and does online. Quickly, before it’s too late. I found out through the grapevine that Josh Cahil asked for a free upgrade when he was onboard the flight and the crew knew who he was after they did a quick check online. While I can understand where MAS is coming from, knowing who Josh is they should have handled the situation more tactfully and offered the upgrade in order to provide him with a “better” experience as we all know how subpar their Economy service is. 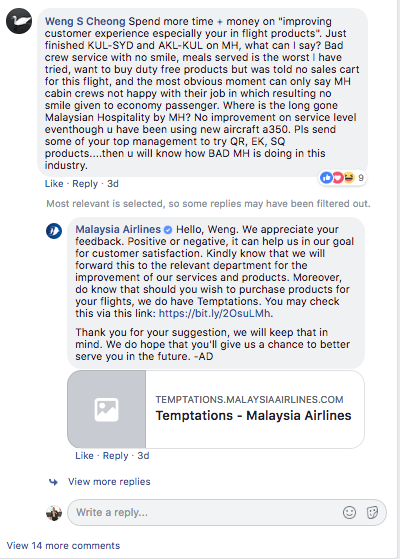 Now its become a social media fracas that is gaining traction while MAS continues to respond with the predictable bot replies. Thanks for dropping by and for your comment. What’s wrong with asking for an upgrade? Every self respecting frequent flyer tries to get one. It’s how you deal with it that matters and obviously Malaysia Airlines got it hopelessly wrong this time. As I say in the piece, the training isn’t up to the promises made. But you are right, there are also process issues that need to be addressed. There is probably a blanket ban on upgrades to save money. Well they may have saved a bit of money on the upgrade but its cost an absolute fortune in negative publicity. « Does it make sense to rebrand Kuala Lumpur’s taxis?